Marking the end of an era, spacewalkers Andrew Feustel and John Grunsfeld removed the no-longer-needed COSTAR corrective optics package from the Hubble Space Telescope today and replaced it with the Cosmic Origins Spectrograph, an $88 million state-of-the-art instrument designed to study the large-scale structure of the universe. The $50 million COSTAR, or Corrective Optics Space Telescope Axial Replacement, was installed in 1993 during the first Hubble servicing mission. It was equipped with small mirrors that exactly counteracted the spherical aberration marring Hubble's famously flawed primary mirror. COSTAR routed corrected light to all of Hubble's instruments except the Wide Field Planetary Camera 2, which had its own built-in corrective optics. 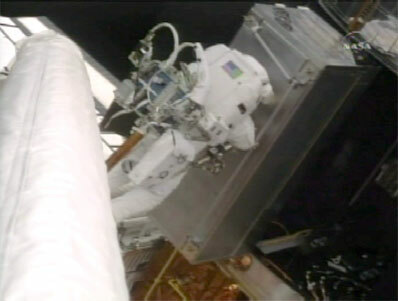 "This is really pretty historic, pulling out the COSTAR," astronomer-astronaut Grunsfeld noted as the spacewalkers prepared to remove the boxy 800-pound instrument. With COSTAR temporarily stowed on a fixture mounted on the left side of Atlantis' payload bay, Feustel and Grunsfeld opened the Cosmic Origins Spectrograph storage box, disconnected a ground strap and released bolts holding it in place. Then Megan McArthur, operating the robot arm from inside Atlantis, moved Feustel and the new instrument back to the space telescope. Holding COS vertical, Feustel and McArthur, with guidance from Grunsfeld, carefully moved COS into position to engage the same guide rails that held COSTAR in place. The astronauts had no problem sliding COS into place, locking it down and connecting electrical cables to complete the installation just past noon. "Great job, excellent. COS is in there," Michael Massimino said from Atlantis' flight deck after Grunsfeld drove in a latch bolt. "Nice work, boys." "The Cosmic Origins Spectrograph is a physics machine," Grunsfeld said in a NASA interview. "Whereas the Wide Field Camera is taking images which contain a lot of physics and a lot of information, the spectrograph takes the light that's coming from an object and breaks it up into tiny little bins by frequency and allows us to see spectral lines that are caused by oscillations of, of electrons and atoms, transitions between states, and from that you can tell the temperature, the density, all kinds of important details of what's going on, say, in a stellar atmosphere or in the gas between stars. "And in particular, the Cosmic Origins Spectrograph is going to investigate the space between stars in our own galaxy, interstellar medium, and even more important, the space between galaxies in the universe. When the universe was made, just like when you build a house, there was a lot of stuff left over, and the shape of that stuff is a critical factor in determining what the nature of the universe is, and in particular subjects like dark matter. "Because normal matter, the stuff we're made out of, hydrogen gas, helium gas, all the atomic elements, will clump around this dark matter that has the same effect of gravity as regular matter but doesn't interact the way normal matter does with light, so we can't see it. And it turns out the structure of the universe is dominated by this dark matter. The Cosmic Origins Spectrograph will be able to look through the universe and, using this physics tool, help us understand what the universe is made of and, and how it was formed."